The Alexander Technique is a system of body awareness and a practical method of “undoing” acquired habits of muscular and mental tension to recover the free mobility of childhood. The Alexander Technique is an individualized educational method to achieve physical well-being through awareness of balance, posture, and coordination. Frances Marsden is a certified Alexander Technique teacher who trained in London under the tutelage of Walter Carrington, who was in turn certified directly by the method’s developer, Frederick Mathias Alexander. She teaches both privately and as faculty of the Alexander Training Institute of Los Angeles and part-time faculty of the Occidental College Department of Applied Music. After 35 years editing technical reports and magazines, scrunched up in front of a computer screen most of the time, I was chronically stressed in my neck and shoulders. Working with Frances after I retired, I learned to let go of this tension. Her hands are magical, and my lessons have changed the way I sit and walk and enjoy my life! For example, I no longer climb stairs by trying to pull my body up with my shoulders. When I do have to sit in front of a computer, I feel comfortable, relaxed, and alert. 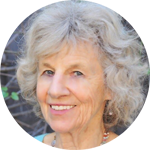 Frances is a marvelous teacher – her gracious and relaxed manner make her a joy to be with while you benefit from her immense teaching skills in teaching the Alexander Technique. I came to her in pain from a back injury and she not only helped guide me out of that crisis, but helped me discover a greater ease in how I use my body in anything I do. Frances is an extraordinary Alexander Technique teacher. Her coaching has made a huge difference in my performance as a French horn player. After her coaching, I gained four inches in sleeve length and went up three jacket sizes because of my shoulder width. Years after my training with her, I can feel when my body is out of equilibrium and I now have the tools to make corrections. Studying the Alexander Technique with Frances has done more to improve my clarinet playing than anything else I have tried in the 20 years since my last formal clarinet lesson. Her calm presence, wise insight and gentle physical guidance enabled me to release a fuller, warmer tone than ever before. Frances’ gentle but always forward looking approach gave me the confidence to give up the cane and walk more like a healthy normal person. The Alexander Technique has given me a new, more positive sense of myself and to see that I was more than my disease. I stumbled into the Alexander Technique. I had no particular problems, no need to fix anything. Looking back, I’m astonished at my lack of awareness as I check off the long list of profound changes that snuck up on me. After many years practicing with Frances, I still look forward to seeing her. Her calm, focused presence creates a canvas for finding something new in familiar movements. The simple, feathery touch of her hands vaporizes obstructions and reenergizes all circuits. At the end of a lesson, I float into a brighter, clearer world. Contact Art of Movement | Designed by G.O.D.